Time to jump in and learn the Basket Weave Square. This is the second block in the Crochet Stitch Sampler Baby Blanket CAL Sponsored by Red Heart Yarns and hosted by Marly Bird. This is one of those stitches that becomes easier after you get through the first 10 rows but prior to that it feels a little clumsy. But I think with the written instructions I’ve provided and the HD Video and the charts you will get there. Regarding the charts…*deep sigh*…part of me hesitates to give you the charts for this square because I feel like they might be more confusing for you. Please know that is not my intention, let me explain. There was a LOT of deliberation between the testers and my self about the best way to present the symbols on the basket weave charts. Some wanted me to have the symbols represent on each row with the actual stitch symbol that you would be working. My problem with that is that a chart is supposed to be a direct visual representation of what your fabric will look like on the right side/public side. For most crochet charts this is the case without having to worry about changing symbols, but when we are dealing with stitches that look differently on the RS vs. WS or vice versa that doesn’t hold true. Therefore, in an attempt to keep with the idea that a chart is supposed to be a direct visual representation of what the fabric will look like on the right side/public side, I’ve decided to present the charts as if you are looking at the RS of the fabric. What this means is the double crochet post stitch symbols have to be distinguishable as to RS or WS. 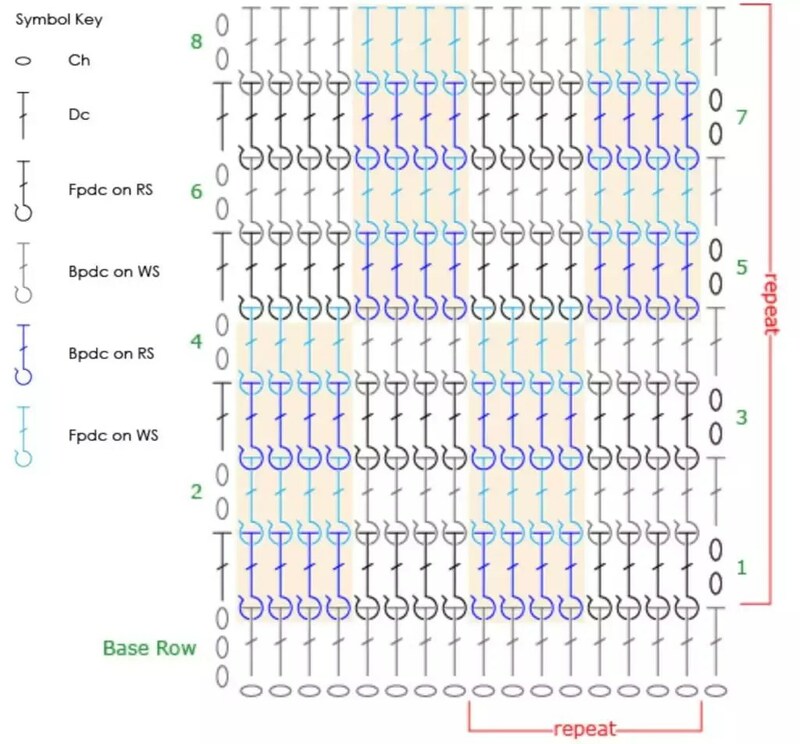 Just like in knitting when you read a chart and it has a blank square and the key reads ‘knit on RS and purl on WS’; the blank square is the same symbol but when you see it you have to know whether you are on a RS or WS of the fabric to know which stitch you are supposed to use. Same will go for the post stitches. I chose the Basket Weave Crochet Stitch as the second square because you’re fresh off the 1 x 1 Double Crochet Ribbing square which was made with post stitches and the basket weave uses them too. So, instead of throwing something totally new at you, I figured it would be nice to work on a square where you are already familiar with all the stitches. Plus, it is nice to see how the same stitches can make such different looks when worked in a different pattern. The basket weave crochet stitch uses the basic double crochet stitch for the entire square but the texture and unique look of woven fabric is created by the placement of the double crochet. We will work these double crochets in the front post and the back post of the stitches. By doing post stitches the square will be more 3d with great texture, visually stimulating and it is a reversible stitch. Designer NOTE: Original was made with a discontinued yarn–STITCH NATION by Debbie Stoller™ “Washable Ewe™”: [for sample size blanket] Complementary colors: 2 balls each 3903 Strawberry, 3540 Currant, 3501 Robin Egg, 3652 Clover; Main Color: 3 balls each 3365 Earth. The trick with the basket weave is remembering that alternating the post position on every 5th row you are doing and to pay attention to the Right Side (RS) and the Wrong Side (WS). Why are there two different chain amounts? Well, for each square stitch pattern you decide if you are going to learn the stitch first with the in class block size or if you are a dare devil and want to jump in and start on the full size block. Either way, choose the correct chain amount below. If you want to use this pattern stitch for another pattern you need to know how many chains are used for the foundation. For the Basket Weave–Foundation chain is a multiple of 8 sts + 4. Base Row (WS): Sk 3 ch (counts as 1 dc), dc in next ch and each ch to end. Row 1 (RS): Ch 2, (counts as 1 dc), sk 1st st, * fpdc around each of the next 4 sts, bpdc around each of the next 4 sts; rep from * to end, dc in tch. Use a stitch marker to mark this as the RIGHT SIDE of the square. Rows 2-4: As row 1. Time to change up the pattern to get the basket weave effect. Rows 6-8: As row 5. This is the foundation chain amount I did for the full square in the sample blanket. You will notice that adding a half repeat of the stitch pattern makes the block symmetric. Meaning, if you begin with fpdc you will end with fpdc and vice versa. If you want to use this stitch pattern for another pattern and you want it to be symmetric then your foundation chain is a multiple of 8 sts. Regarding the CHART: It is important that you follow the specific chart for this stitch count if you are following along with the chart. Use the FULL SIZE BLOCK chart for this multiple of stitches. 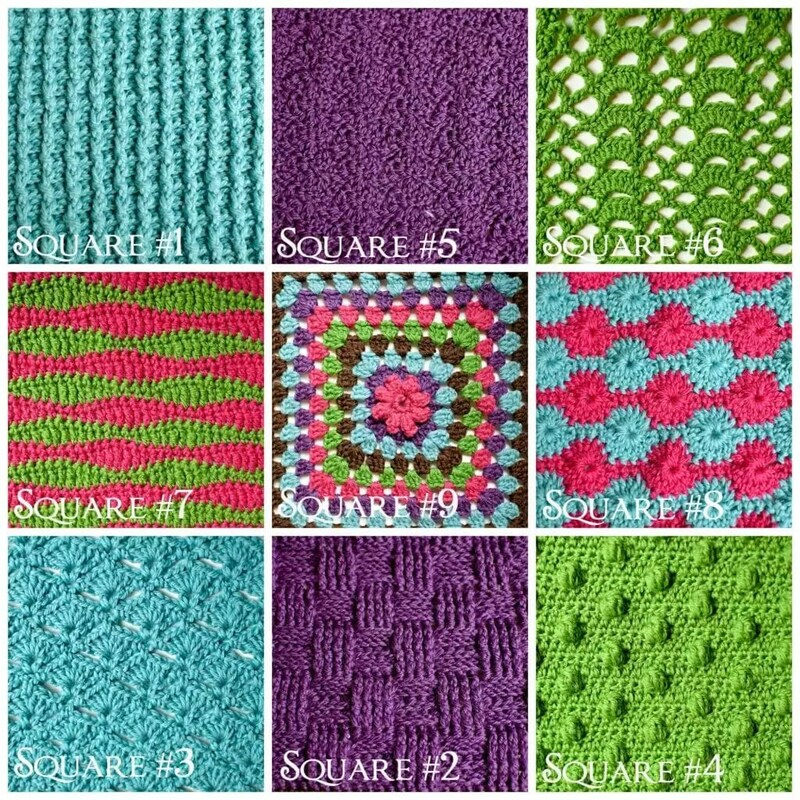 This number of stitches will give you the same size squares as long as you use the correct hook size to get the size you want. Designer NOTE: This square tends to be a tad wide. I was able to make my square the same size using the larger hook/the same hook I used for the 1×1 double crochet ribbing BUT some of the testers found that dropping a hook size was needed for this square. Alternative Full Block Chain Amount: If you want to not do the added half repeat that makes the full block symmetric you can choose to do a chain of 44 and follow the instructions as written for the in class block. This is another option for those of you who might have a hard time getting the squares to match in size. No matter which chain amount you use, be sure to check your measurement as you go to make sure your first square will match up to this one. Remember, you will use the size hook YOU need to get the finished square will be the correct size YOU want. Row 1 (RS): Ch 2, (counts as 1 dc), sk 1st st, fpdc around each of the next 4 sts, * bpdc around each of the next 4 sts, fpdc around each of the next 4 sts; rep from * to end, dc in tch. Use a stitch marker to mark this as the RIGHT SIDE of the square. Row 2: Ch 2, (counts as 1 dc), sk 1st st, bpdc around each of the next 4 sts, * fpdc around each of the next 4 sts, bpdc around each of the next 4 sts; rep from * to end, dc in tch. Row 5: As row 2. Row 6: As row 1. Row 8: As row 1. First, it is important that I point out that these charts are to be read as if the RS is facing you. Which means a symbols meaning on the RS will mean the opposite on the WS. Take a look at the key given with these charts; I’ve color coded the symbols so you know the difference. If you are printing the page it is best to do it in color. If your printer is only black and white, you can still use the charts but you will have to make note that the odd rows are RS and even rows are WS. By placing a stitch marker on the RS of your work after row 1 you will not have any problem knowing which side is which. Each of the charts provided in this pattern are written with the same number of foundation chain stitches. I did this so that you have a complete chart that allows you to see exactly what stitches go where for the entire swatch or square. Unlike some of the other pattern stitches in this blanket, for the Full Size Block of the Basket Weave crochet stitch pattern, the chart (see FULL SIZE BLOCK) also has the same chain amount because I thought it was easier for you to work this pattern with a full chart like that. Given that it might throw some of you off that the whole square is not made up of full repeats as I added half a repeat to make the square symmetric. *REMEMBER: this chart is written as if the RS is always facing you. Notice that the numbers on the sides count the rows. You can use these numbers to let you know from which side you will begin reading that row of the chart. For example: Row 1 (RS) will be read from the right to the left; Row 2 (WS) will be read from left to right. As noted (several times by now) the chart is made with the symbols representing the Right Side (RS) view of the fabric. That means, that if a stitch symbol on the RS is a FPDC and you are on the Wrong Side (WS) you will actually do a BPDC. Hence the reason the symbols are color coded. It is to let you know…hey, this is a FPDC on the RS but because you are working on the WS and it is shaded gray so you will be doing a BPDC for that stitch. The BPDC you do on the WS you will actually look like a FPDC on the RS. That might not be very clear yet, but hopefully you can begin to work the pattern and see what I mean. Designer NOTE: I find it easier to read a chart like this one (where the symbols NEARLY look identical) by shading in the symbols. If you use a colored pencil and shade in just the back post stitches or just the front post stitches you will be able to quickly see what the stitch is without having to strain to see if the symbol has the little bar pointing in towards the circle or out away from the circle. That is why the 4 row sections are shaded orange. Again, it is important that I point out that these charts are to be read as if the RS is facing you. Which means one symbols meaning on the RS will mean the opposite on the WS. Take a look at the key given with these charts; I’ve color coded the symbols so you know the difference. The chart is made with the symbols representing the Right Side (RS) view of the fabric. That means, that if a stitch symbol on the RS is a FPDC and you are on the Wrong Side (WS) you will actually do a BPDC. Hence the reason the symbols are color coded. It is to let you know…hey,this is a FPDC on the RS but because you are working on the WS and it is shaded gray so you will be doing a BPDC for that stitch. The BPDC you do on the WS you will actually look like a FPDC on the RS. Designer NOTE: I find it easier to read a chart like this one (where the symbols NEARLY look identical) by shading in the symbols. If you use a colored pencil and shade in just the back post stitches or just the front post stitches you will be able to quickly see what the stitch is without having to strain to see if the symbol has the little bar pointing in towards the circle or out away from the circle. That is what I had done in the pattern chart above. Learn this stitch pattern either with the in class block or the full size block. Once you feel like you have it, make your square for the blanket and get ready for the next square. It will be released on Tuesday. If you have only just started, that is okay! It is not too late to join in the fun. Marly, the stitches on the photo of the purple Basket Weave stitch really pop and shine! Is that from the photography? What a beautiful photo — I mean gorgeous! I just found this on a search for basketweave crochet. Is it me, or are all the symbols supposed to be of front post dc? I know there is something about rs and ws, but shouldn’t the symbols on a particular row ALTERNATE between the two?